Social Media is one of the best investments a small business can make. It allows businesses to function as brands and interact with their present and potential customers. To make the most out of social media, small businesses need more than just social media tips, it needs a full-scale social media guide. The most common mistake that small business owners make is that they think they need to have every social media channel available so they immediately start posting to Facebook, Twitter, FourSquare, Instagram, Yelp, Pinterest, Google+, and SnapChat. No one can do all of that well and still run a business. Instead, the better approach is to take a step back and determine where your customers are spending time. For example, if you're an RV Dealership in Arizona, the chances are pretty good that your 50+ year old customers are not on SnapChat, Instagram, FourSquare, or Pinterest. They may have heard about Twitter but they're still not really sure what it is or why their grandkids spend so much time on it. Instead, they probably spend most of their time online on social media sites such as Facebook, Yelp, and Google+. Therefore, that's where that business owner should focus his efforts. One you do some research and figure out where your customers are spending their time, it's time to build out a Social Media Calendar. I like to use Excel because it allows me to keep a birds eye view of my posts throughout the year. You want to plan out what you're going to say for the year before you actually start doing it. Having a Social Media Calendar is a great way to do that. It allows you to stay focused, not forget to post, and to make sure that you're telling a consistent story throughout the year that isn't duplicative or boring for your followers. In order for a small business to effectively track its social media performance, it needs to start by setting goals. Worthy goals are SMART goals: Specific, Measurable, Attainable, Relevant, and Time-bound. Keeping the SMART guidelines in mind allows for strong goal setting and a clearer action plan. Social Media Goal: Increase the number of fans and followers. Social Media Goal: Increase the number of fans on Facebook by 30% by the end of 2016. The first goal was sloppy and vague. To increase the number of fans and followers on social media is a typical goal that you see on pages that produce random social media tips. The second goal, however, provided a concrete action plan and a clear line of thinking, it intends to increase the number of Facebook fans by 30% by the end of the year. The second goal is definitely SMART: It was specific on what it wants, the goal can be easily measured, the goal wasn’t way beyond reach, it’s focusing on a relevant Social Media site, and it knows when it needs to be done. Making sure you’ve established SMART goals is winning half of the social media battle. After determining which goals are SMART enough for your small business’ social media activity, it’s time to determine the right users of social media for your small business. Just like goals, vague description for your audience won’t do. It needs to involve various facets of a person in order to get a clear picture of what your audience should be and how you should engage them in order to achieve the social media goals you’ve set for your small business. The Buyer Empathy Map allows you to compartmentalize the internal and external activities of your target social media user in order to gain fresh perspective from their point of view, like putting yourself in their shoes. Creating a Buyer Persona is an essential part at determining your audience. Coupled with the Buyer Empathy Map, you’re getting the big picture of who your target audience are, what they’re doing, and how you can connect with them. 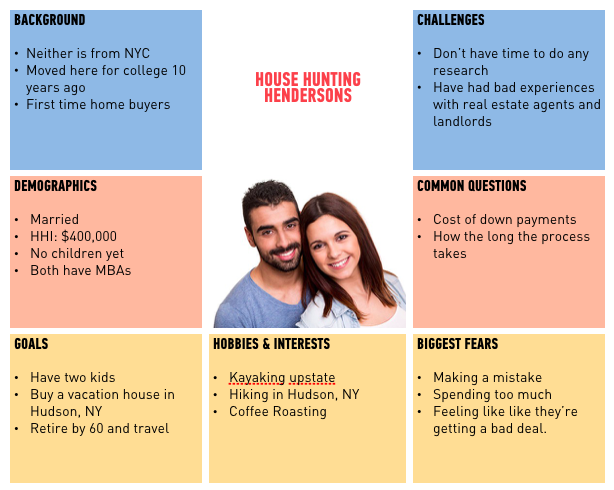 To create a Buyer Persona requires that you know their background, their pain points, their demographics, their psychographics, their goals, their fears, their hobbies, and their interests. Then you create a fictitious person that serves as your model or your persona. This persona should accurately capture the activities on your Buyer Empathy Map, as well as the qualities and traits you’ve initially listed. Knowing them with such in-depth detail ensures that you know your social media users inside out and you can carry out your small business’ social media goals effectively, as your intimate knowledge about your users help you craft original and insightful content that reaches out to your users, something they can extremely relate to. After establishing SMART social media goals and your audience, it’s time to scan the internal and external environment of your small business’ social media presence. It’s necessary to know the present state of your business’ social media for you to be able to bridge your SMART goals and your audience. Effective scanning can be done through Threats, Opportunities, Weaknesses, and Strengths or TOWS analysis. Your external environment is comprised of threats and opportunities on social media and your internal environment is comprised of your small business’s social media strengths and weaknesses. Through TOWS analysis, you start by examining the external environment: the social media threats and opportunities. List out every present and potential social media threats and opportunities and make sure every stone is unturned in order for the latter half of the analysis to be effective. Next is to ruthlessly determine your small business’ social media strengths and weaknesses. After having every threat, opportunity, weakness, and strength out in the open, it’s time to brainstorm and nitpick every possible approach that will allow you to effectively leverage your small business’ social media strengths in order to exploit online opportunities and neutralize threats at the same time. Then you’ll have to pinpoint which weaknesses should be addressed as soon as possible to plug present and potential threats without compromising opportunities. Let your SMART social media goals guide you through your social media TOWS analysis. There are a lot of social media strategies available that small businesses can readily adopt. And most of small businesses end up using a bit of each strategy on a regular basis. While trying all strategies is not a bad idea, failing to have a fixed social media strategy is one way to end up with a convoluted social media presence, making it hard for social media users to recognize your brand over the others. The Active Strategy focuses on constant activity between the brand and users. This means maintaining an open, direct, and constant line of communication in every relevant platform in order to reach out with as much users as possible. The Active Strategy is the most common social media strategy due to being cost-friendly. All you’ll need is sweat equity and the desire to have varying degrees of conversations with your brand’s community. Games and promos are usually offered to spark interest and conversations, as well as converting a casual observer into a loyal user. Out of the 4 strategies, this strategy will require most time and effort. The Information Strategy focuses on establishing authority as its objective. Being known as Key Opinion Leader or KOL is a vital element at putting and keeping your small business’ social media presence on the proverbial map. Being a KOL means users will head towards you first for information and advice. The Information Strategy requires consistent output of social media tips that are fresh, informative, and practical content that users will appreciate and rely on. It will need expert insight or someone with firsthand experience in order to provide accurate information and in-depth explanation. Providing vague and overused information content is a huge no-no as it will backfire by letting social media users see you as another generic content-producing social media brand. This strategy requires strong domain knowledge that users will see as genuine and reliable. Infographics, listicles, and quick tips are your go-to content for the Information Strategy. Unlike the Active Strategy, which requires a constant line of communication with users, the Boost strategy aims to empower and uplift its users. Its activities are a fusion between active and information, only that its sole focus is to strengthen its users and its bond with the community. In the early days of social media, brands understandably adopt the Boost Strategy as it’s easier to connect with the users on an intimate level and be able to establish itself as a genuine, caring brand at the same time. Over time, however, brands opted for other social media strategies as the Boost Strategy ended up being overused. Fortunately, the recent inclusion of attendance features, the rise of public events, initiative for public causes, and intimate brand to user interaction provided this strategy a great opportunity to make it relevant again. The Boost Strategy’s content typically includes inspirational and aspirational messages. It also employs strong loyalty incentives and programs, while exercising community outreach programs and initiatives. If the Information Strategy focuses on being the KOL, the Leverage Strategy focuses on acquiring KOLs for their social media activities. It’s no secret that affiliation with KOLs or influencers is a great way to boost your social media fans and followers, and as well as your social engagement rate, that’s why the Leverage Strategy is the most effective at getting followers and boosting engagement rates quickly. The Leverage Strategy’s content typically includes post alignment with its KOLs, like posting content that complements the brand and the KOL, or guest-posting, where KOLs posts personal content for the brand’s social media accounts. Usually, the Leverage Strategy involves contract signing and constant interaction with the KOL, therefore making this strategy the costliest out of the 4 social media strategies. When posting social media content, your goal should be to elicit these 4 emotional responses in particular: Awe, Desire, Affection, and Laughter. These 4 emotional responses are great at making users attach positive thoughts and experiences to brands. Achieving any of these 4 emotional responses will ensure your social media engagement rate is high, tilting the the social media site’s exposure algorithm to your favor. Invoking the 4 Emotional Responses is much easier when you abide the social media content guidelines, which is necessary to make triggering the key emotional responses easier, ensuring content quality, brand recognition, and user engagement. When posting videos and images, follow the 80/20 rule: 80% image or video and 20% text. When a content is full of text, users typically zone out, wasting the effort at crafting the content. Bear in mind that in the world of smartphones and increasingly short attention span, a content with an appropriate amount of text isn’t only good, it’s necessary. Make sure that photos and videos are of the highest quality. Poorly captured photos and poor editing automatically lowers your reputation to users. You don’t have to spend money on getting HD photos from stock photo databases, there are sites that offer free HD photos like Pexels and Pixabay. Since you’re on social media to promote your small business, ensure that your brand name and logo is always visible. Make sure that its placement is subtle enough not to distract users away from the meat of the content. Ensure that you’re not asking users to jump through hoops whenever you’re delivering content focused on call-to-actions. Remember the KISS principle when it comes to call-to-action content: Keep it short and simple. Talk the way your users talk. Having a social media user persona makes it easier to achieve this. Strive to match their voice and tone to keep the personal effect going. Maintaining corporate voice and tone and using obscure jargons is a sure-fire method that will keep your social media users at bay. Be relatable. Make communication with your users easy. When creating content, strive to make it mobile-friendly. Remember that mobile device users have already overtaken desktop and laptop users. Choose and design images that perform well in smaller screens and make sure text content won’t require more than a scroll to completely read it. This will help you with SEO as well. It’s not that farfetched to claim that Facebook, Twitter, and Instagram always come to mind whenever the word Social Media is mentioned, this is because they’re the Social Media Trinity, the three major social networking sites where people log on to post and view content, interact with brands and other users, or just to plain hang out. So far, Facebook is the dominant social media site when it comes to sheer number of users. Facebook should always be included on your list of social networking site due to the potential number of users you may acquire and its flexibility as a brand platform. It is also the reason why Facebook is always included in every social media guide. Facebook has been spawning innovative feature after innovative feature making sure it’s getting the best out of every social networking site out there: content boosting, audience targeting, GIFs, 360-degree videos, in-depth analytics, built-in store functions, and multi-platform social connection. Facebook is great with any social media strategy. Being on Facebook is a no-brainer. Twitter is the perfect place to catch up on trends and posting short content that are to the point. It’s the perfect place to post live updates and track real-time feeds, that’s why news sites typically flood there. Twitter complements any social media strategy as well, but it works perfectly with the Information and Leverage strategy due to its authoritative hashtag trends feature, where the most-trusted Twitter accounts shine above the rest. Instagram serves as one’s personal space. Unlike Facebook, where content can be too commercial, and Twitter, where authority works best, Instagram offers a break by letting people post personal and artistic content to express themselves, the only catch is they should be photos or videos. Instagram is best when it comes to Boosting Strategy as it’s a perfect platform for aspirational and inspirational posts. This is where behind-the-scenes and other form of candid shots should be posted, and the reason why millennials love it. Instagram is where you reveal the human side of your social media brand. LinkedIn is the perfect place for career-related content and Business-to-Business social media interaction. Posting on LinkedIn lends credibility as well as exposing yourself to potential clients and great hiring candidates. It’s a great place to expose your brand to yuppies and baby-boomers. Quora is a great Q and A site that offers candid answers to curious question. Community activity, exposure, and response are off the charts as long as you’re providing great answers and thought-provoking questions. Using your personal account, you can plug your brand after providing a genuine, well-formatted answer and be able to further improve your brand’s image by answering follow-up questions. A big plus: it provides great SEO benefits as well. Google+ may seem like a tepid choice for social media presence, but when small businesses are serious on getting their social media presence together, they make sure that they’re on Google+ as well as it provides a great benefit no business should scoff at: Strong SEO support. Remember that Google’s SEO algorithm feature involves being indexed quickly. Because Google+ is made by Google as well, you can see that indexing on this social networking site is extremely smooth and fast, thus the great SEO benefits. Last, but not the least, is your social media findings and feedback. This is the part of the social media guide where you tease out extremely crucial insights to know the trends, when to post, what content works, and how your social media audience reacts to different things. Without the findings and feedback stage, you wouldn’t know how close your small business is to achieving its social media goals or whether it’s making any progress at all, making it an important part where you derive sense from all the data you’re receiving. Last but not the least, this stage allows you to replicate what works and allows you to stop doing what doesn’t, ensuring efficiency in the long run. Social listening is an activity where you monitor social media trends and activities to improve your small business’ social media performance. This can be done through manual work like hashtag tracking or by using automated tools like Google Alerts and other aggregated social monitoring tools like Sendible and Radian6. Some social media sites, like Facebook and Twitter, have built-in analytics tools for brands in order to capture, measure, and gauge their social media progress. Instagram has yet to include a built-in analytics, but for now Iconosquare and Simply Measured offers the much-needed Instagram analytics. Properly document findings and feedback during determined intervals, weekly, monthly, quarterly, and yearly, so you could have invaluable information you can lean on in the future. As long as you closely follow this guide, your experience using Social Media for small businesses will be as straightforward as it can be, effectively bridging the needs of your small business and your brand in social media.